Ah, the year. 1988. The year of 8-8-88. Middle school. Also, as it just so happens, the year of my new car! That's right. 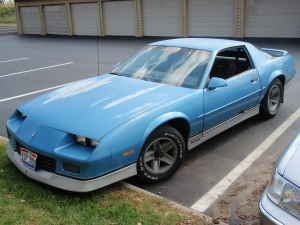 A not-so precious 1988 IROC-Z Camaro base model V-6 manual is in my possession. For a while now I've been obsessing over getting an old car and now it has finally happened. 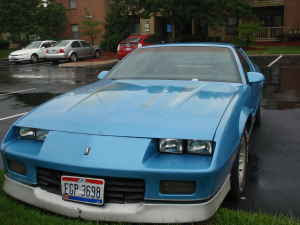 Well, in actuality, it is for the sweetest lady I've ever known, BUT she can't drive manual yet, sooooo... I got it for a song. Alas, however, a song is all it is worth (well, worth maybe a PS3 and a couple games, I'll put that purchase off for a bit). Okay, well... that's the goal. Get on your short jean shorts, grow yer mullet, rip off your t-shirt sleeves, and crank up the Styx. 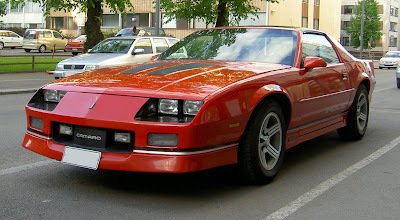 It's a Camaro!